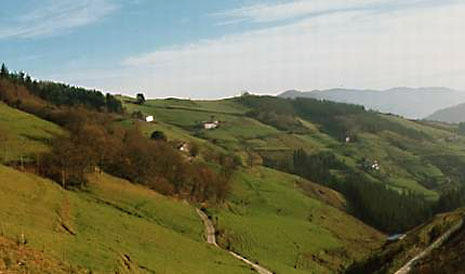 The hills of Kalamua and Morkaiko, situated between Eibar and Elgoibar, are part of the range that forms a watershed between the basins of the River Deba and those of the rivers Lea and Artibai. The range stretches from Urko to the pass of Urkaregi, better known as San Miguel. The southern slopes of Kalamua are part of the municipal area of Elgoibar, and here can be found the rural neighbourhoods of Idotorbe (San Pedro) and Aiastia (San Miguel). This area, well known for the charm of its scenery and its well kept environment, possesses a large number of interesting historical and ethnographical sights. View of the rural neighbourhood of Mandiola, in Eibar (Gipuzkoa). The peak of Kalamua (771m. ), marking the limit between Elgoibar, Markina and Etxebarria, is one of the best vantage points in the physical map of the Basque Country. However, beautiful though the panoramic view afforded by the summit may be, no less so is the foreground of its own slopes, carpeted with a green blanket of pastures dotted with dozens of white farms. The unearthing of historic remains proves that this area has been inhabited at least since the Neolithic or Bronze Age. Evidence of this can be found near the summit of Kalamua, with the dolmens of Diruzulo and Olaburu. Further down, near the small rural enclave of Idotorbe (San Pedro), the remains of an Iron Age fort can be seen on the hill called Moru (approximately 800 BC). Strategically placed, any incursion up the Deba basin could be observed from its fortified heights. From San Miguel: next to the pelota court, follow the track that leads to Oa Nagusi (access to Kalamua and Morkaiko).